Kansas City Kansas – Page 3944 – Welcome to Wyandotte Daily! The Schlagle Library’s insect photography contest is in full swing. The annual contest closes at 5 p.m. Friday, Sept. 5, when contest entries are due. Those interested in participating in the photo contest may submit an 8×10 photo of an insect, and have their art displayed at the library. Prizes will be awarded for winners from juvenile (16 and younger) and adult (17 and older) categories. Photos should be submitted framed, ready to hang an labeled with a phone number, name, email address and age category. A digital copy of the photo also is required for online voting. One entry will be accepted per person. 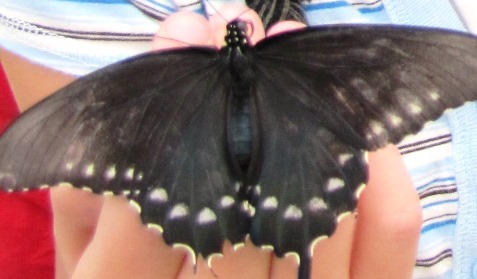 Winners will be announced at the ninth annual Lawson Roberts Butterfly Festival on Saturday, Sept. 27. The Mr. and Mrs. F. L. Schlagle Library is at 4051 West Drive, Kansas City, Kan. The location is inside Wyandotte County Lake Park, 91st and Leavenworth Road. For more information, call 913-299-2384 or visit www.kckpl.org. Northbound I-435 right lane over the Metropolitan Avenue bridge, between K-32 and Kansas Avenue, will be closed for bridge deck repair work beginning at 9 a.m. on Tuesday, Aug. 26, and reopening to all traffic at 2 p.m. Thursday, Aug. 28, in Kansas City, Kan.
Traffic may start slowing down at 8:30 a.m. when traffic control will be set up. 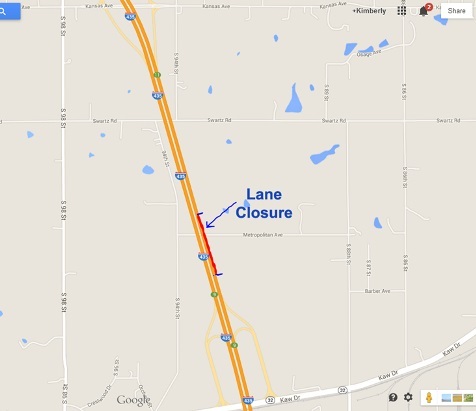 Traffic will be directed through the project work zone via signage, cones and arrow boards. Drivers should expect some delays during the daily peak time commutes and may wish to adjust their travel times accordingly. Updated daily traffic information for this project and the entire Kansas City metro area can be viewed online anytime at: www.ksdot.org/kcmetro/laneclose.asp. The Kansas Department of Transportation urges all motorists to be alert, obey the warning signs, and slow down when approaching and driving through the project work zone. Last year Regina Weir stood on a median in a downtown Kansas City, Kan., intersection and handed out dollar bills. It was the “Bucks for Buckles” program, and she was giving dollars to cars whose drivers and passengers were wearing seat belts. Those who were not wearing seat belts received an informational brochure. The “Bucks for Buckles” program will be back this September in Wyandotte County in a location and date to be determined, Weir said. She is with Safe Kids Metro KC, and she gives presentations and classes in Wyandotte County on a variety of safety issues involving children. Weir said the organization receives a mini-grant from State Farm Insurance Co., usually around $250 to $300, to do the “Bucks for Buckles” education and awareness program. Last year in Kansas City, Kan., “I was quite surprised to see so many people wearing their seat belts,” she said. Drivers told her three main reasons why they wore seat belts: First, they did not want to get a ticket; second, their kids or grandkids had been encouraging them to buckle up, so they got in the habit; and third, they didn’t like the sound of beeping in their cars when they didn’t use the seat belt. The “Bucks for Buckles” program will start on the Labor Day weekend across Kansas, running Aug. 24-Sept. 6. It is sponsored by Safe Kids Kansas, State Farm and the Kansas Department of Transportation. Seat belts save lives, according to Safe Kids Kansas. Kansas ranked 40th in a national survey of states’ seat belt usage.